Hugo Boss is a well known designer of luxury fashion. 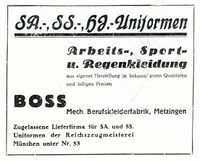 The company was founded in 1924 by Hugo Boss, who originally supplied uniforms to Nazi Party organizations. This page was last modified on 24 February 2017, at 16:09.